It was a simple exchange, but it tells volumes about the conflict within that atheist boyfriend. Something prevented him from partaking of the Eucharist because deep down, he knew – perhaps without realizing it – that this was much more than just a bit of bread. During the past two weeks, our Gospels have been walking us through the 6th chapter of the Gospel of John, the profound Bread of Life Discourse. We read how Jesus fed the crowd of five thousand with only five loaves and two fish – a sign which pointed to much more than a simple miracle. Then, we read about how the crowd pursued Jesus and pressed Him to give them manna, bread from heaven that will satisfy them always, not just for a time. This week, Jesus responds to them by launching into the heart of the Bread of Life Discourse. He does this in two parts: The first part has to do with belief, believing that Jesus is indeed God incarnate, come down from heaven. The second part has to do with eating the Bread that has come down from heaven. God is always drawing us toward Him. Our belief is the work of God’s grace within our souls. That is what Jesus meant by His response, “No one comes to me unless the Father who sent me draw him.” I submit that the discomfort that atheist character in Chesterton’s story has its roots in the grace of God at work in his soul. The boy refused to encounter God yet was never comfortable or at ease with that. We are not meant to feel at ease when we are separated from God. The journey of life is too much for us without the sustenance that God wants to give us. Our First Reading tells us the story of the prophet Elijah on the run from the pagan Queen Jezebel for killing off the four hundred prophets of Baal, the false god. Elijah hit the limit of his endurance and prays for death. Yet, God instead sends him an angel to feed him. This journey or pilgrimage we are on in this life is an arduous one because forces of darkness are trying to push us away from God. It would be easy for us in the short term to live without faith in God. Yet, while that would be easier for the world, it would be critically unhealthy for our souls. Without sustenance from God, our souls will hit the limit of their endurance. We need to continue to feed on prayer, developing our relationship with the God who made us and loves us. We need to learn more about God and His profound connection to us. That is why spiritual reading is very important. Most of all, we need sustenance from Our Lord Jesus Christ, who gives us His very Body and Blood, Soul and Divinity as our food. 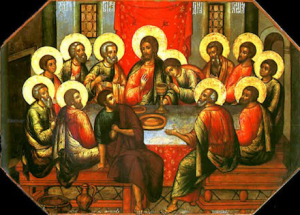 But, as we will see next week, the Eucharist is not simply a bit of bread. Next week, we will see how Jesus responds to the reaction of the crowd when He insists that unless they eat His flesh and drink His blood, they will have no live within them. Let us, then, rest assured in our belief in the One who has come down from heaven. Let us believe … and receive Him.